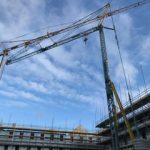 Towards the end of 2017 we had two Self Erecting Cranes on an Accommodation Project in Gloucester for one of our clients. The two cranes, a Terex CBR40 and Potain HDT80, were placed on the project in September 2017 to work in tandem on the project. 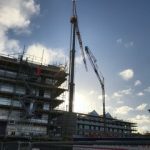 The project is to construct a 295-bed student accommodation with associated works comprising access, temporary surface level car parking, landscaping, public realm works and lift access.